Every year, hundreds of thousands of Americans are diagnosed with chronic kidney disease. While there are many common risk factors, such as diabetes, family history, and poor lifestyle habits, the larger problem is that most Americans lack a basic understanding of how your kidneys work. 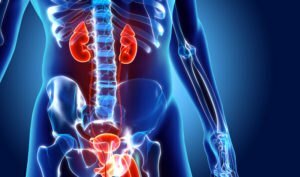 Understanding what normal kidney function entails is one of the best ways to plan prevention strategies. The kidneys serve to filter blood, removing waste products and excreting them through urine. This helps to regulate the body’s electrolyte balance including sodium and potassium, among others. As the body detects certain levels of electrolytes or blood concentration, it can stimulate the production of red blood cells, in addition to helping with the regulation of blood pressure in the body. The receptors on kidneys help to provide auto-feedback to the body to help maintain optimal levels of blood health. The body has two kidneys that are located just below the ribs on both sides of the body, running towards the back. As with all organs, the kidneys are made up of millions of cells organized into filtering units called nephrons. These nephrons are a complex filtering system that responds to the detection of high or low levels of certain chemicals in the bloodstream. This stimulates the production or removal of these or other chemicals that are needed for the body. The vast majority of the fluid that runs through the kidneys is returned to the body with only a small amount being excreted daily. With a healthy diet and proper fluid consumption, kidney health is usually relatively easy to maintain. However, if conditions such as diabetes or hypertension are present, the kidneys will be under added stress that may cause kidney disease. The risk is even greater when a family history of kidney disease is present. Fortunately, many kidney diseases can be successfully treated if they are detected early on. Working with a nephrologist will help ensure you are taking all of the necessary steps to allow your kidneys to function properly in their role of filtering the blood and removing waste, promoting overall blood and fluid health in your body. Durham Nephrology Associates specializes in caring for people with kidney diseases and high blood pressure. With locations in Durham and Oxford, the team of physicians, nurses and staff have been devoted to the welfare of patients for more than 25 years with the goal of stopping or slowing the progression of illness to improve and sustain kidney health. If you or someone you love has been diagnosed with chronic kidney disease, call (919) 477-3005 to schedule an appointment.